WASHINGTON, D.C. -- As President Barack Obama prepares to leave the Oval Office, Americans are more likely to believe history will judge his presidency positively than negatively. Overall, 47% say he will be remembered as an "outstanding" or "above average" president, while 35% believe he will be judged as "below average" or "poor." The current ratings are significantly more positive for him now than prior measurements taken late in his first term and early in his second term. How do you think Barack Obama will go down in history -- as an outstanding president, above average, average, below average or poor? The results are based on a Jan. 4-8 poll. Today's more positive appraisals of Obama compared with 2012 and 2013 reflect improvement in his job approval rating over the same time period. Currently, 55% approve of the way he is handling his job as president, compared with 50% in February 2012 and 43% in November 2013. The improvement in Americans' evaluations of his legacy has outpaced the growth in his job approval score. Obama's job approval rating has increased 12 percentage points since 2013 while the percentage predicting he will be remembered as an outstanding or above-average president increased 19 points. Meanwhile, ratings of him as "average" have fallen 13 points, and negative evaluations are down a total of five points. Gallup asked Americans to predict Obama's legacy, along with retrospective evaluations of the 11 prior presidents back to Dwight Eisenhower. Obama's 47% outstanding/above average ratings put him behind only John F. Kennedy (79%), Ronald Reagan (63%) and Dwight Eisenhower (50%). 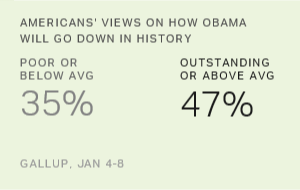 At the same time, only Richard Nixon (56%) and George W. Bush (41%) have higher below average/poor ratings than Obama. Consequently, just 18% of Americans rate Obama as an average president, far less than the mean of 35% for the other 10 presidents. Americans may be more likely to give Obama a positive or negative evaluation because his work as president is fresh in their minds. It might also reflect the greater political polarization that marked his tenure as president. Along those lines, 84% of Democrats rate Obama as outstanding or above average, while 69% of Republicans say he will be remembered as a below average or poor president. Taking everything into account, Obama compares favorably with past presidents. His net rating of +12 among U.S. adults -- the percentage who rate him positively minus the percentage who rate him negatively -- is better than most other presidents, except Kennedy, Reagan, Eisenhower and Bill Clinton. It is far better than his predecessor George W. Bush's -19 net rating. Kennedy has the highest net, at +78, while Nixon's -43 is easily the worst. Jan. 4-8, 2017; Net rating is the percentage outstanding/above average minus the percentage below average/poor. Gallup has asked Americans to predict how history will judge presidents near the end of all presidencies back to the Gerald Ford administration. Evaluations of presidents can change many years after they have left office, when the impact of their policies can be assessed through a historical lens. While some presidents are evaluated differently now than when they were while preparing to exit the Oval Office, there has been no clear pattern in how presidential ratings change over time. Specifically, three recent presidents -- Reagan, Ford and Clinton -- are rated very similarly today to how they were rated around the time they left office. Two -- George W. Bush and Jimmy Carter -- are rated better now, and one -- George H.W. Bush -- is rated less positively. Current ratings are from Jan. 4-8, 2017, poll. Net is % outstanding/above average - % below average/poor. Although Clinton and Reagan, along with Ford, have similar ratings now to when they finished in the Oval Office, all have experienced some change in the interim. Most notably, Clinton's ratings today are significantly lower than they were in 2012 and 2013. Clinton's returning to a more active political role, campaigning for his wife Hillary in the 2016 presidential campaign, may have affected the way Americans judge him. Reagan's ratings also briefly worsened in 1993 (to 38% positive and 24% negative), after then-president George H.W. Bush was voted out of office after serving the political equivalent of a third Reagan term. George W. Bush and Carter are rated better now than when they left office, though neither is rated very positively in an absolute sense. Shortly after Carter lost his re-election bid to Reagan in 1980, Americans were much more likely to think Carter would be judged negatively than positively. Now, Americans are split about evenly in evaluations of the Carter presidency. Bush is still rated more negatively than positively overall, but his below average/poor ratings have decreased by 18 percentage points in the last eight years. Proportionately more Americans now say Bush was an average president. Obama will hope to avoid the fate of George H.W. Bush, who was rated more positively when he left office than he is today. The elder Bush's presidency is still rated positively overall, but his outstanding/above average ratings are down nine points since he left office in January 1993 while his below average/poor ratings are up by a similar amount. President Obama is leaving office on a positive note, with approval ratings above the majority level and more Americans saying history will judge his presidency as outstanding or above average than as below average or poor. The public opinion data suggest a president's approval ratings at the end of his presidency may matter more for how he is judged historically than his approval ratings throughout his time in office. For example, Clinton and Reagan exited with higher approval ratings than was their norm for their presidencies, and they are among the highest rated modern presidents in these retrospective evaluations. In contrast, Americans regard George W. Bush and Nixon as the worst recent presidents from a historical perspective. They both had very low approval ratings when they left office although other presidents, such as Ford and Carter, had worse term averages while holding office. Accordingly, Obama's current mid-50s approval ratings appear to be outweighing his 48% term average in determining how Americans evaluate his presidency now and may continue to aid assessments of his historical legacy in the future. View more data in the Presidential Job Approval Center. Americans say the U.S. gained ground over the past eight years on four out of 19 policy issues, while it lost ground on 14 and held steady on one. President Barack Obama finished ahead of President-elect Donald Trump in Gallup's 2016 most admired man poll, 22% to 15%. Hillary Clinton is the most admired woman. As President Barack Obama prepares to leave office, Gallup and Healthways are publishing a new series examining how Americans' health and well-being have changed during his eight years in office.